When Father’s Day approaches, it’s also my reminder that strawberry season is near. It’s been a few year since I’ve gone to pick berries, but last week we got lucky with an cool overcast day and returned to Jones Family Farm in Shelton. Admittedly, I got carried away and came home with WAY more berries than we could ever eat. We didn’t stop picking until our “berry box” was filled close to the brim! And while $30 felt like a steal for so much locally grown fruit, I still had to figure out WHAT TO DO WITH 11 LBS of STRAWBERRIES! 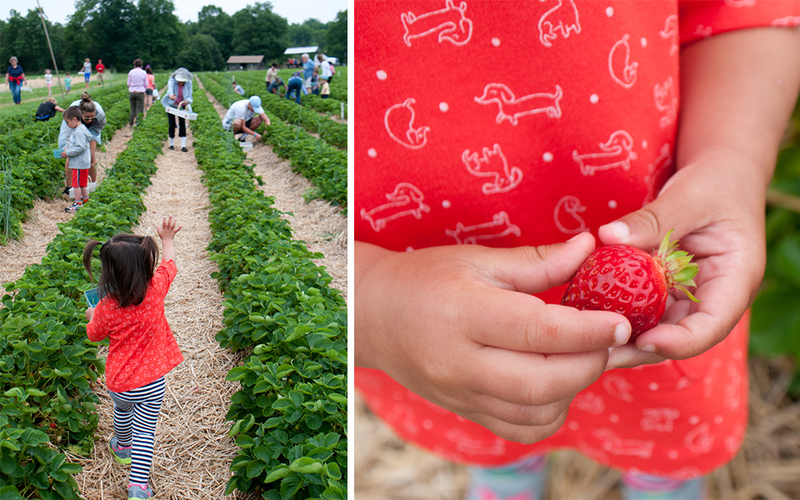 Want to head out on your own strawberry picking adventure? Always call ahead to the Farmer Jones Crop Line (203-929-8425) to be sure the fields are open. We picked at Pumpkinseed Hill Farm, though Valley Farm was also open. Listen for the street address for your GPS. There are multiple locations for the fields, depending on the season. At other times of the year, you’ll find blueberries, pumpkins, Christmas trees and a winery! If you have the option, I recommend going on an overcast day. There is no shade in the strawberry field and though picking goes relatively quickly, even an hour in the blazing June sun can be tough. As an added bonus, outdoor photos are often much better when it’s overcast and there aren’t deep shadows caused by overhead sunlight! You’re visiting a farm. Sensible, closed-toed shoes are a good idea. There is hay in the aisles between the berries, but after a rain, there is a chance of mud. I also don’t recommend wearing anything white or that could be ruined by a red berry stain. No matter how hard I try, I always seem to leave the field with a red splotch somewhere on my clothes. A checkbook or cash. No credit cards accepted. Our filled box was about 11 lbs and just shy of $30. There is a discounted price per pound, if you pick over 8 lbs in one box. A hat, sunscreen, bottle of water and anything else you might like to battle the full sun (if it’s a hot summer day). Leave as much as you can in the car. You’ll be picking low to the ground. Don’t saddle yourself with bags or other items to track while you’re in the field. 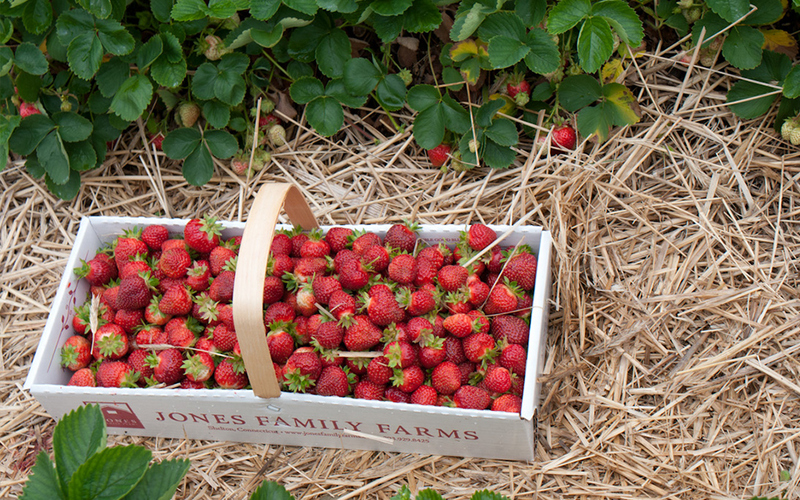 Jones Farm supplies a long rectangular “berry box” with a handle or small quart baskets. You’ll receive a credit if you re-use your box on a future visit. 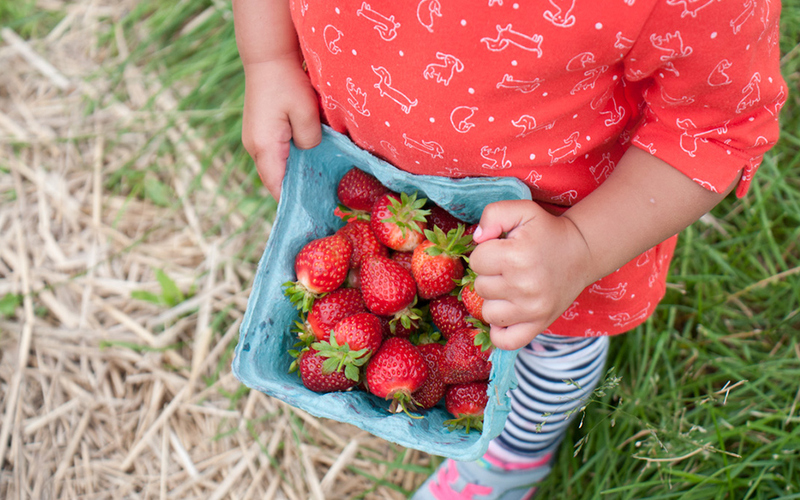 If you’re going with kids, get them each a quart basket and have them consolidate their berries into the main large berry box before you leave the field. Hop on the “berry ferry” which will give you a short ride out to the field. Once there, Jones Farm staff will direct you to your own row of berries to pick. Before you start picking, take a minute and honestly consider how many berries you can use in the short term (or freeze). Time to pick! Lift up the green leaves and you’ll see the ripe red berries beneath. Gently pinch the strawberry stem slightly above the berry. If you pick your entire row and still want more berries, you can ask to be assigned to another row. When you’re done, you can walk back to the checkout building near the entrance or take another ride on the Berry Ferry. If you’re carrying more than a few pounds of berries, I recommend catching a ride, even though it’s not a long walk. Get your berries into the fridge or freezer as quickly as you can. 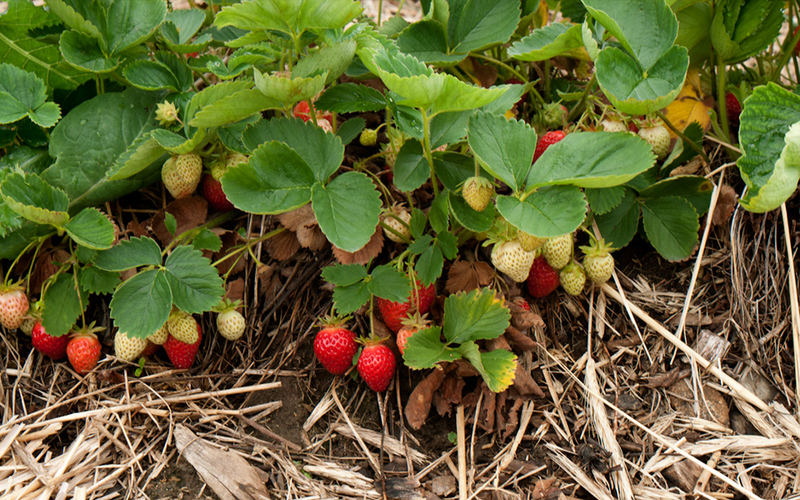 Once picked, strawberries are highly perishable and do not stand up well in extreme heat. How long does strawberry season last? This varies from year to year, but typically strawberry season is winding down by the end of June. Blueberry season is up next, often starting around the 4th of July. Again, be sure to call the crop hotline to get the latest updates. What became of all these berries? Some were destined for the freezer. I also decided to bake a few strawberry-rhubarb pies. I sourced local rhubarb from Rose’s Berry – vendors at the Saturday Downtown Milford Farmers’ Market. For a recipe, I turned the ever reliable Smitten Kitchen and was pleased with the suggestion to use tapioca to firm up the fruit filling. Happy picking! If you’ve got a favorite strawberry recipe or another PYO tip, I’d love to hear it in the comments section.